Yesterday was a tough day personally. Surprisingly I headed into the day holding onto a small morsel of hope that the cycling world could be set back on track, a track which had been anything but straight and narrow for decades. By late morning that hope was dashed, gone with the news that the UCI and License Commission had awarded Team Astana a 2015 WorldTour License. We can get into talk of probationary periods, legal evidence and rules, but these topics apply only when you are in the meetings and extremely close to the situation (or the bank accounts). It doesn't require too many steps back from the center of the storm to realize that most people were expecting a change to be loudly made. This time we really needed a demonstration of leadership. In the weeks ahead of the licensing decision by UCI, the media embarked on a heavy campaign - digging through their archives - to write any additional information they had to throw in the incriminating pot of "they did wrong" against Astana. By Tuesday, people held their breath, the hope held dear - UCI has no choice, they must not give Astana the license, it is the only right thing to do. Apparently in a cheating sport, right has no place. On Wednesday, December 10th, the international governing body of professional cycling demonstrated, through their timid actions (report), that they have no real power at this point in time to correct the invalidity of the sport of cycling. A license was granted to Astana, a team with five recent positive doping samples from five athletes and a long history of trouble, yet denied to the Europcar team for insufficient financing. From my view, I can no longer look at any bike race and know the best man will win. Instead I know the best cheater will win. I had hoped that reality would be corrected in the new era of cycling, it will not. It is clear the story of changes in cycling was PR to keep the sponsor dollars flowing and the fans coming (which is what the sponsors want). It becomes senseless to spend time in the future getting excited about a competition, or promoting an event, when I can only visualize the outcome resembling the last 1 kilometer of the 2012 Olympic road race when the known doper Alexandre Vinokourov effortlessy broke free to win the gold medal with the peloton left staring ahead defenseless. My heart sunk knowing Vinokourov would be Olympic Champion for four years; my heart sinks every time I look at the seven-year gap in the history of the Tour de France; my heart sinks every time I realize a young athlete will be forced to dope to compete. My mind becomes numb in trying to find some reason to continue to support professional cycling. Yesterday voices were heard denouncing the UCI's actions, voices were heard commending the outcome, photos were seen of the Astana team celebrating with champagne. But tell me this - what rider wants to compete against a corrupt team, what sponsor wants to give money to either have their brand name tarnished by doping or watch their clean team consistently lose? Why would any young rider want the shame of declaring he or she is a professional cyclist? Why would any sponsor support a corrupt sport? Why would any fan want to spend their time on the events of a cheating sport? I don't think the UCI fully realizes how many fans finally had enough yesterday and turned their backs on the highest level of professional cycling. If I were a sponsor, I would immediately redirect my dollars to recreational cycling, to local events, to young junior riders and to the MAMILS of the world. There is no reason not to refocus our attention on the common man who loves riding on two wheels. It is the every day cyclist who is a much more noble cause than a cheating pro. I was going to make plans to attend the 2015 Tour de France, I was going to make plans to attend the 2015 World Championships in Richmond, VA, I was going to make plans to attend the 2015 USA Pro Challenge in Colorado - instead I think I will take my own trips in 2015 to ride my own bike and not waste my time on what will be a corrupt outcome in a corrupt sport. I'd rather hang out with my friends and stay healthy. Any sponsors interested in following the exodus from pro cycling can find the Regular Joe Cyclists out on the road using your products themselves. Come join us for some good honest fun. We'll be out doing it ourselves. 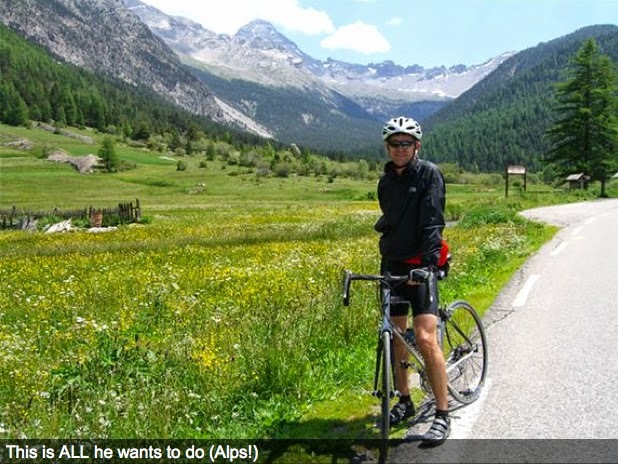 Riding with my brother in the Alps - photo by Karen Rakestraw of Pedal Dancer. Update 12/16/14: The highly respected voice of America sport - Juliet Macur - has written an honest article about the Steve Johnson finally departing USA Cycling. Executive’s Ride Into Sunset Signals Brighter Day for U.S.A. Cycling, By Juliet Macur for The New York Times.